HP wants your kids to be the talk of the playground by providing a range of new PCs targeted at the 2015 back to school shoppers. The announcement also included a very significant spoiler. The company pulled the covers off a range of all-in-one desktop and tower PCs plus a 4K monitor, while at the same time accidentally revealing a next-gen AMD Radeon GPU that will have gamers drooling. HP spilled the beans on AMD's unannounced Radeon R9 380 GPU as part of its Envy mid-tower range. The Envy tower is primarily focused at content creators that have a thirst for the strong graphics performance required for video and photo editing. Customers can pick from an Nvidia GTX 980 or the aforementioned AMD Radeon R9 380 GPU in addition to a fourth generation Intel Core i5 or i7 chip or AMD A-Series A8 through to FX processor. Complementing this is the gaming-focused Envy Phoenix mid-tower that can be configured with a fourth-generation Intel Core i5 or i7 chip and is designed to support gaming on a 4K display through the same GPUs mentioned above. Inside the shell there is an advanced thermal system that uses Closed Loop Liquid Cooling products and can handle up to a 3TB of HDD or a faster 512GB SSD. Both machines come with a range of different ports, dual-monitor support and will be available in the US from June 10 with a starting price of $699.99 for the Envy and $899.99 for the Envy Phoenix. 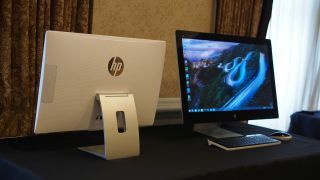 Following in the footsteps of HP's back to school notebook announcement earlier this year, the 21.5-inch, 23-inch and 27-inch Pavilion All-in-One PCs bring to the table a modern design that has already seen TechRadar give it a favorable comparison to the Apple iMac. Each model has an edge-to-edge full HD touchscreen and can be configured with various Intel Core or AMD CPUs, and has AMD Radeon GPU options. Under the hood there is the option to pack it with up to 3TB of storage and it brings stellar sound through Bang & Olufsen dual speakers. The 21.5- and 23-inch models will be out on June 28 in the US and have respective price tags of $649.99 and $699.99. For those that want a Pavilion tower PC there is a new look option that comes in blizzard white, natural silver, nobel blue, and sunset red and gets the choice of a fourth-generation Intel Core i3 to i7 processor, Intel Celeron chip or next generation AMD A-Series A4 to A10 processor. On the graphics side of things it has an Nvidia GTX 745 GPU and possesses an HDD with a capacity of up to 3TB. It also gets a range of different ports, B&O Audio and when it is released on June 26 it will have a starting price of $449.99. Last but not least is the 32-inch HP Spectre Studio Display that offers users a sharp ultra-HD 4K resolution (3,840 x 2,160), 178-degree ultra-wide viewing angle and is optimised to up-scale HD, full HD and quad HD. It has HDMI 2.0 and HDMI 1.4 with MHL ports, a display port and USB port, and will be available in the US from May 24 for $999.99.